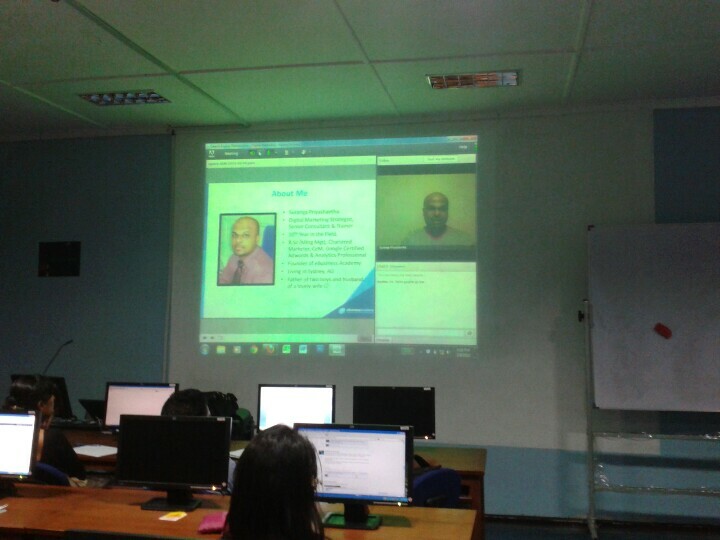 Yesterday, I had the opportunity of being the coordinator of what could be the first ever live web-based lecture at the faculty of management, of the Sri Jayawardenepura University (I may be wrong to say this is the first, but you are free to correct me in the comments section). It was a live lecture on the topic Search Engine Marketing, conducted by Suranga Pryashantha, (currently based in Sydney Australia). For about one and half hours, Suranga delivered his lecture over a Webinar connection, and at the end of the session a direct Q&A session was conducted, with students posting their questions at Suranga over a Facebook group and Suranga responding to the questions directly on the webinar. Last month we (Neo@Ogilvy) partnered with the department of marketing management at university of Sri Jayawardenepura to initiate this digital marketing course, to uplift the level of digital marketing skills among future marketers of Sri Lanka. Throughout this course we plan to experiment some novel ideas like this, to see how effectively we can use some of these new technologies for effective delivery of education. Conducting web-based lectures by resource persons stationed overseas was only a dream when I was at the university about 10 years ago. Those days we only had 2 computers for the entire university, with access to the internet. I remember how we had to wait in queue after registering our names on a reservation book, to access internet for just one hour. Within that one hour, we would only be able to fully load maximum 10 web pages (that again only if you are really lucky) thanks to the ‘excellent 52Kbps’ bandwidth we used to have at that point of time in Sri Lanka. 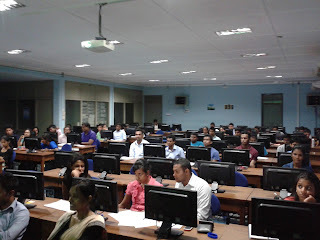 However, when Suranga delivered that lecture the other day, almost all the students were seated in a computer lab with latest facilities and 100% internet connectivity with 4Mbps leased line broadband. I believe, a lot depend on the students and the permanent members of the faculty when it comes to deciding how best they can use these resources. At the end of the day, if these computers are used to teach the students how to use Microsoft Word and PowerPoint, I believe it would be a major waste of resources. There are many interactive social tools which can be used as classroom resources. At Ogilvy, we use Webinar platforms like Go-To-Webinar to conduct training for regional staff while using platforms like Moodle to host self-study courses and assessment tests. Suranga’s own initiative of Ebusiness Academy is another prime example of how best you can use technology in education. EBA easily is the number one eMarketing and Social Media training institute in Sri Lanka with over 500 marketers being trained in their workshops and training courses up to now. As a resource person of EBA’s Social Media course, I know how effective these virtual classroom sessions are. In a way, virtual classroom method saves a lot of cost and the students are getting the benefits in return. Rather than paying a couple of thousand US dollars to attend a one day seminar at a luxury hotel, they can invest equal or lower amount of money and expose to more in-depth coverage of subject matters over a longer period of time. We all know the Khan Academy as a perfect example of Education 2.0. I believe it’s high time for Sri Lankan educators too, to think like Salman Khan. To think out of the box and make use of at least some the freely available resources like Google Apps Docs, YouTube, or Moodle.